Here’s a few of my favorite Cell Phone pics from our road trip. 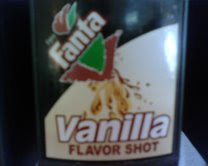 We stopped at a little Mexican place in Amarillo, Texas, and they had flavor shots for sodas! I don’t drink soda often, but sometimes a good ol’ fashion Vanilla Coke does the trick. 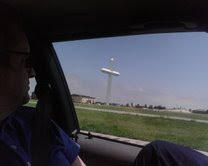 The sign said this was the Largest Cross in the WORLD! I don’t know if I believe that, but it was pretty big….. and in the middle of NOWHERE! This is my official vacation project. 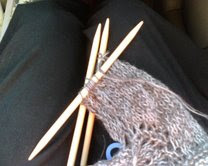 Never mind the fact that I’ve also finished 2 shrugs and a puppy hat on this leg of our vaca….. this is the official project that will eventually come with us on our cruise. I’m still new to knitting, so this is super exciting for me. My first top down sweater, and my first go at double pointed needles! Look at that… IT’S A SLEEVE! 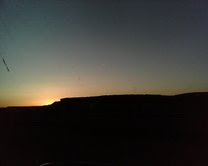 My cell phone camera doesn’t do this sunset justice, but I still thought the contrast between the dark land and the crisp sky was pretty sweet. Day 2 of our cross country drive is done… now… on to day 3.